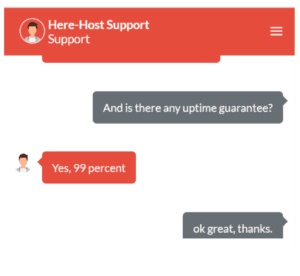 Here-Host Review 2019: Is Here-Host a Good Hosting? Here-Host offers VPS, dedicated, and storage servers along with colocation service and support. Located in Plovdiv Province’s Sopot Municipality, this Bulgarian company takes pride in its brand new Supermicro and Dell servers, up to 256GB DDR4 RAM, unmetered bandwidth, 36 cores (72 Threads) CPU, and up to 20 Gbps network speed. Here-Host’s journey started in 2016. However, the seeds of its establishment were sown sometime around 2014 when 1 Gbps uplinks were taken as the standard, while affordable unmetered plans and dedicated servers with 10Gbps ports were extremely scant. After having years of experience in internet architecture and global server management, the founder of the company (and his team) knew they could do it much better and differently, and thus was Here-Host born. Today, its servers are located in Telepoint (Sofia – the Bulgarian capital). The company’s website supports English. Here-Host offers 99% uptime guarantee, which is lower than the industry average.. It provides three VPS plans – Mini, Basic, Super, and Mega. These plans vary in terms of CPU cores (1, 2, 4, and 8 respectively), RAM (2, 4, 8, and 16 GB respectively), and disk space (10, 30, 60, and 120GB respectively). The company also offers ten dedicated server plans, out of which six (which are Dell Mini, Mini Plus, Basic, Super, Mega, and Business) use Dell servers, while four (which are Basic, Basic Plus, Mega, and Business) use Supermicro servers. All these dedicated server plans have further variations available in terms of RAM, storage, and traffic. If you need high capacity dedicated servers with large storage, Here-Host’s three dedicated Supermicro storage servers plans (Basic Storage, Basic Storage Plus, and Mega Storage) are what you should look for. Just like dedicated servers, these plans too come with further variations available in terms of RAM, storage, and traffic. The company also provides colocation service in its datacenter. Using its colocation configurator tool, you can build up your colocation plan that meets your needs in terms of server units, traffic (Mbps), PSU (W), IPv4 and IPv4 subnet/your ASN or network. The best thing about all Here-Host plans is the customization option. In case the existing plans don’t suit your needs, you can always get them tailored to your needs. 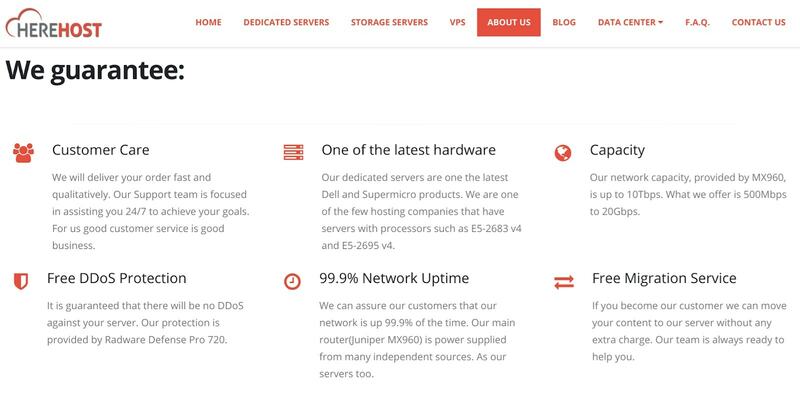 Here-Host’s entry-level VPS and storage servers are competitively priced. But the real deal is its dedicated servers, which are great for the cost-conscious shoppers. And with a fourteen-day money-back guarantee, you can try any of these plans without any worry. All plans of Here-Host are payable in USD, Euro, or Pound. You can pay for them on a 1-, 3-, 6-, or 12-month basis via credit/debit cards, PayPal, or Bitcoins (a type of cryptocurrency). You can reach the company’s support staff 24/7 via the live chat option. You can also use email, phone, and a ticketing system to get quick on-site support. I tested (and was extremely impressed by) their 24/7 live chat option. However, you can’t request technical assistance through it, as the live chat is only for emergency and sales requests. In case you need technical assistance, the company’s ticket support system is the fastest way to solve your issue. If you believe in self-help, Here-Host’s FAQ section and blog will surely serve as great tools. If you are looking for reliable VPS, dedicated servers, storage servers and colocation services that can be customized to your needs, your search ends at Here-Host. Speed up your website with Here-Host’s dedicated hosting. Wondering how Here-Host stacks up against other Web Hosting companies? Enter any other Web Hosting company and we will give you a side-by-side comparison.